Anchoring is sometimes fraught with hazards, but the most unexpected difficulty arose when we anchored at one of the islands in the Galapagos. This quiet bay has a beach at its head on which the sealions bask in the sun. Our guide and advisor (a mandatory requirement for all boats cruising there) said that we could go ashore as soon as she was happy that there were no males around as they would attack us in no uncertain terms. While we waited at anchor the female sealions came to pay us a visit. The anchor and anchor chain were a great fascination and they attempted to lift the anchor but thankfully without success. During this time I dove into the water wearing a snorkel mask and played with them as they swam in circles round and round the chain. They would come right up to my mask and blow bubbles at me (as they had seen me blowing bubbles and they were mimicking that). They were such fun that from time to time I laughed so much that I frequently gulped water and had to surface in a hurry before drowning. A tourist boat came to the wharf and inadvisably went ashore without checking and we had more laughs as we watched the big male sealion chasing them. 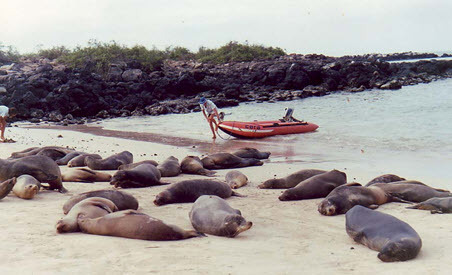 When all had quietened down – male sealion and tourists gone – we took the dinghy ashore. As soon as we left the dinghy a couple of lazy sealadies climbed into the dinghy and sunned themselves on the back thwart. Off we went to explore only to see the dinghy moving away. These playful marine creatures had pulled up the dinghy anchor and were happily towing it out to sea. An hour scrubbing the inside of the dinghy afterwards was a small price to pay for the pleasure these creatures had given us.